Groundhogs (Marmota monax) have short pregnancies and spend twice as much time caring for their young after they are born. Unlike many of their other rodent relatives, who are prolific breeders and give birth to several litters of offspring per year, groundhogs give birth to just one litter annually. Male groundhogs emerge from hibernation in late winter or early spring, normally coming out of their burrows in March throughout much of their range, and begin the mating process by establishing territories and dominance among other males. The latitude and altitude of the groundhogs' habitat will determine when hibernation ends, with southern populations emerging earlier in the year than northern populations and those at high altitudes. Females emerge from hibernation in the days and weeks after, and mating will occur in March or April. Groundhog females have just one fertile period per year, and mating occurs only in the spring. Dominant male groundhogs will mate with multiple females during this time, as groundhogs do not form monogamous pairs. 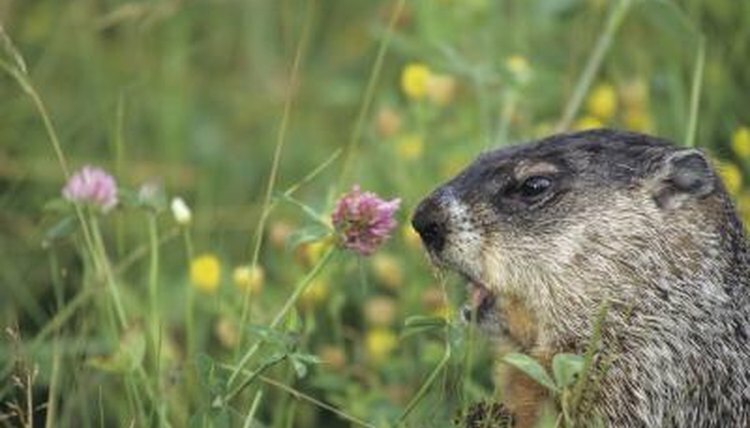 After mating, female and male groundhogs have no further interaction with one another. A typical groundhog female will have a gestation period of 30 to 33 days following successful mating. During this time, the female groundhog will establish a nest of plant fibers inside an underground burrow or den, where she will give birth and nurse her young. These dens are usually established in well-drained soil along hedgerows, in pastures or along woodland edges, and may include multiple exits and entries. Groundhogs give birth in their dens to between one and nine infants, with four or five being the most common litter size. Younger females tend to give birth to smaller litters of pups. Groundhog newborns emerge from their mothers weighing approximately 1 ounce. At this stage, groundhog pups are pink, naked, deaf, blind and helpless. Female groundhogs are the sole caregivers of groundhog pups. For the first month of life, groundhog pups are blind and rely on their mothers for survival. As they mature, groundhogs will begin exploring their dens, digging and spending small amounts of time aboveground, as well as eating solid vegetation that the mother brings into the nest. The young groundhogs will stay with their mothers until they are completely weaned -- approximately 44 days after they're born. Once the groundhog pups have become fully weaned, the mother will begin to show aggression toward her young, prompting them to disperse from the den and become independent at approximately 2 months of age. Both male and female groundhogs reach sexual maturity between the ages of 1 year and 2 years. "Wild Mammals of North America"; George A. Feldhamer et al., eds.